Pamela Wood was a long-time MIT music faculty member, an accomplished singer, and a beloved teacher. A staunch advocate of the works of Black composers, Ms. Wood introduced these works to students and audiences throughout her career. The Lewis Music Library invites you to join us at a lunchtime concert to honor Pamela Wood and celebrate her legacy with selections from Black musical traditions performed by MIT’s talented student musicians. 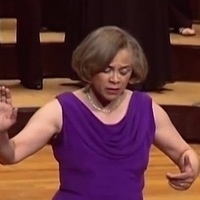 Pamela Wood’s career as a vocalist encompassed a wide range of styles, from opera to recitals, from traditional to contemporary, from spirituals to a stint with the Steve Reich Ensemble in the 1970s. She was a leader in teaching the Kodaly method of ear training and served on the Board of Directors of the Kodaly Center of America. In addition to her 28 years teaching at MIT, her teaching credentials included the New England Conservatory, Tufts University, Wheelock College, Roxbury Community College, and the Boston Public Schools. We remember Pam for her energy, exacting standards of musicianship, and perhaps most of all for her personal warmth and infectious laugh. Please join us in a musical celebration in her honor. Email ninadm@mit.edu to let us know about any accessibility requirements.